This railway journey is one of the finest in Southern India over a railway that has World Heritage status with steam locos operating the rack section up to Coonor. Before describing the journey it is necessary to mention that this line has been closed for lengthy periods after sustaining heavy damage from monsoon rains. Closure can be protracted so you may be disappointed and have to 'enjoy' the journey up into the Blue Mountains or the Nilgiri Hills as they are often referred to, by road. The normal service sees one train a day at 07.15 from Mettupalayam on the hot plains of Tamil Nadu to Ooty. This service is arranged to connect with the overnight Nilagiri Express from Chennai. 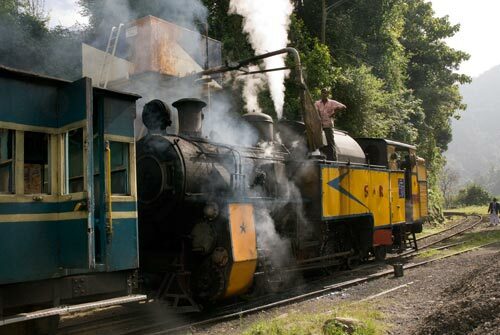 The return journey is similarly organised so that passengers from Ooty can head downhill at 15.00 and connect with an overnight train back to Chennai. Before continuing note that there are a number of acceptable spellings of various place names which is further complicated by the fact that Ooty has been renamed to Udagamandalam! Assuming arrival at Mettupalayam is by overnight train from Chennai, you will detrain into the dawn air at around 06.00 to enjoy the limited resources of the small station. There are basic essentials such as toilets and also a refreshment kiosk, which seems to do a brisk trade. You will soon discover that the train to Ooty is usually full so reservations are essential especially at peak times of the year. You will no doubt see a harassed railway official trying to fend off a crowd of people who are wait-listed for the train or trying to obtain a seat at the last minute. Photo - An X Class 0-8-2T takes water at Hillgrove. Railway enthusiasts will ignore all of this mayhem and cross the tracks to the small locomotive shed where one of the wonderful 0-8-2T rack tanks will be simmering quietly in readiness to head up the hill to Coonor. It is also likely that at least one more loco will be present acting as a spare in case of breakdown. You will also see some of the coaching stock used on the line all neatly presented in a blue and cream livery. As departure time approaches, the passengers settle in their seats ready for the climb into the hills. There is always an air of excitement as most are heading up into the hills on holiday or perhaps their honeymoon. The guard's whistle blows followed by frantic flag waving and the train departs slowly with the loco pushing from the rear. First class passengers are right at the front with a reasonable view ahead up the line. Starting at just over 1,000 feet above sea level, the line is adhesion worked for the first 5 miles to the former station at Kallar, which like most stations on the section to Coonor is now closed to passengers. The rack rail starts here and leaving Kallar a gradient of 1 in 12 means that height is gained steadily. The next station along the line, Adderly is the first water stop. Just over 8 miles from the start the line has now reached 2,390 feet above sea level. Shortly after leaving the station the train crosses Adderly Viaduct which occupies a spectacular location and is often featured in publicity pictures for the railway. Hillgrove is soon reached. This pretty station lies at 3,580 feet and is just over 11 miles from the start. Those who know the line will detrain quickly and make the best of what is on offer from the refreshment kiosk while the loco takes on more water. Loud whistles from the loco ensure that no one is left behind and the train continues its steady ascent into the hills. The scenery is superb and occasionally you will see elephants and other wild creatures from the train. As height is gained you will also the see the first of many tea plantations. The next station is Runneymede (4,612 feet). It is interesting the original names for these places remain even with more than 60 years passing since the British left India, More water for the thirsty engine with 13 miles now completed. The climbing continues through tea estates to Coonor (5.616 feet) the first major town on the line and some 17 miles from Mettupalayam. The station is on the left hand side but over on the right lies the main loco shed with the remaining steam locos either under repair or ready for work. The town is spread across the hillsides beyond and is typical of hill stations throughout India. Sadly Coonor is where we say goodbye to the steam locomotive as it is replaced by a diesel for the remainder of the journey to Ooty. Gone to is the rack rail as the line is not as steep and can be worked by adhesion only. The onward journey traverses pleasant country with excellent views on both sides of the train. The train stops at Wellington (5,804 feet), Aruvankadu (6,144 feet), Ketti (6,864 feet) and Lovedale (7,694 feet) as the ascent is continued. The highest point reached by the line is just before Lovedale from where the route descends to Ooty (7228 feet) some 28.6 miles from Mettupalayam and the end of the line.